Depending on product dimensions our delivery partners will either deliver to your home or local collection point. You will be informed of your delivery method during the checkout process. Our delivery partner will also notify you of your delivery time slot or collection point details. Make a real design statement with MADE.COM's latest outdoor range. This dining chair set will ensure that your garden is as beautiful as the rest of your home. 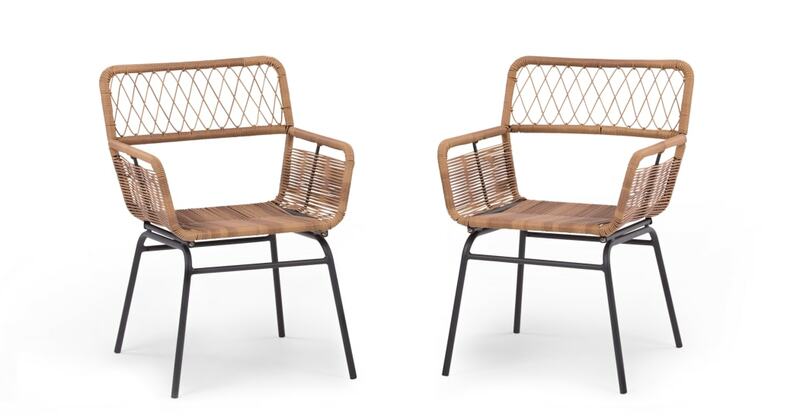 The seats of the dining chairs are woven for extra comfort. They’re ideal for lazy barbecues and summer evenings. The Lyra dining set has two chairs so you can be sociable outdoors. Mix and match with other colours for a stylish look.